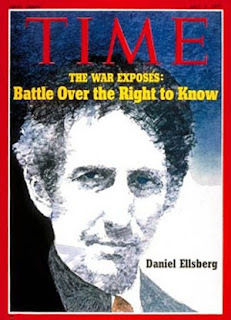 When Daniel Ellsberg released the Pentagon Papers in 1969, he was hailed as a hero while the government received criticism and skepticism on their views of secrecy and what information should be withheld from the public. Today however, such instances of debated risks to national security are not as well received. National security concerns or an excuse to discredit? In providing information of public interest, regardless of intention, such journalists have to be aware of the potential repercussions and backlash they could face. With the heightened fear of terrorist attacks, such leaks could potentially harm public safety, and draw scrutiny, as is the case with Edward Snowden and Bradley Manning (who now goes by Chelsea). Manning has since been sentenced to 35 years in prison, and Snowden is hiding in Russia, beyond the U.S. government's reach. However, the question is: are these threats truly plausible, or is it some government attempt to conflate journalism with terrorism, thereby discrediting such independent journalists, as Alan Rusbridger, editor in chief of The Guardian, suggests? Is the controversy over such leaks really a matter of national security, or an excuse to pit journalists against one another? If the leaks were broken by big news publications as opposed to these independent journalists, there would be no debate; they would receive awards and praise. Now the focus is on the credibility of these journalists, rather than their stories about the government's hidden secrets. As the issue of credibility overshadows the issue of secrecy and national security, WikiLeaks forced their hand to the point where their documents were translated, verified, and legitimized by large news organizations. They gained credibility, and suddenly the focus was shifted. While there is controversy over the plausibility of terrorist threats, journalists do still need to be wary of publishing sensitive government documents, even if they are an issue of public interest. In the New York Times' article Qaeda Plot Leak Has Undermined U.S. Intelligence, U.S. officials claim the leak prompted terrorists to change communications patterns. While the New York Times editor Margaret Sullivan called out the paper for this article, and it has since been called "laughable," it is still important to keep such things in mind, on the off chance it could actually be a national security risk. In my opinion, it is more important to be aware of such documents since it leads to more knowledge. I think it's important to know certain matters the government feels the need to keep secret, and journalists can help bridge that gap. There is constantly a battle over the public's right to know certain information and the government's almost irrational fear of subsequent terrorist attacks. But journalists can "leak" information without compromising the public's safety, despite what the government would have you believe otherwise. It's important for journalists to always be wary (with the threat of compromising our national security not a matter to be taken lightly) without censoring their work because that does not well serve our democracy.